Since our company started in 1999, we have worked with many clients in Statesville, NC on home designing projects. Home Designing in Statesville NC – If you are looking for a team who can assist with home designing and construction, 1st Choice Home Centers is a great option. We have dedicated team members who are happy to assist in designing your dream home and helping it become a reality. Since our company started in 1999, we have worked with many clients in Statesville, North Carolina and the surrounding area on home designing projects. There are many different options for home designing, whether you want a simple home for your family or an elaborate and elegant abode where you can entertain guests. In addition to home designing projects, our team takes on a number of other projects, as well. We can build new garages, which are useful to store your personal items, such as automobiles and recreational vehicles, tools and garden equipment, games, toys, holiday decorations, and more. Homes that don’t include garages often have lower property value than those that do, so if you don’t currently have one, you may want to consider adding one to increase the value. Commercial buildings also benefit greatly from having garages that are able to store extra boxes, equipment, and other important items. In addition to adding garages and designing and building homes, we can add other outdoor living areas to your property. Many people enjoy spending time outside, especially when the weather turns nice. We can build a deck or patio on your property, where you can spend time with loved ones, grill delicious food, and just have good old-fashioned fun together. For more information about home designing, please contact us at 1st Choice Home Centers. 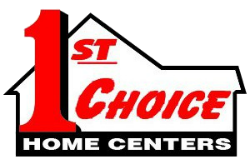 1st Choice Home Center offers quality home designing in Statesville, Troutman, Taylorsville, Mocksville, Maiden, Lincolnton, Conover, Newton, Union Grove, Harmony, Hickory, Mooresville, and surrounding areas of North Carolina.